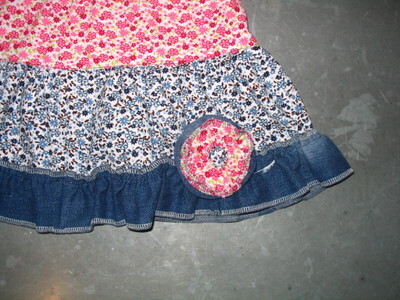 applehead: How to ....make jeans into a skirt! alright!! I may just have to try this!! Like that! Thanks for the tut. Good way to rescue 'holy' jeans. Thanks sooo much for this!!! My daughter has some Levis which are a little short and this will look ADORABLE on her!!! This is sooooooo cute I can't wait to see how mine will turn out! how do you make the ruffles for your skirt? Great tutorial. I have some cute pink baby-cord jeans that I want to turn into a skirt and you've inspired me to have a go! Thanks. I love the jeans are garments that never goes out of fashion, have been used for years and have never left the market by the dozens I have them and use them daily, I love the theme. Hey this is amazing idea to convert jeans to skirt. It' so simple.... really I want to try it. Your blog is so informative. keep posting such an interesting and helpful articles. money as well as clothes. after some times we do not like to use same pattern at that time just cut it in this way and try for new fashion. I find all the articles you provided here are interesting and worth to read. It's so helpful and easy to follow. Thanks so much, I'll try this. Thanks for this post! I am going to be a bit adventurous with the other two so I I'll post pics when they're done! thanks for this content, much appreciated. Once again, I appreciate all your work and also providing a lot vital tricks for your readers. Thank you so much. This will be a great project for my older girl scouts. Thank you so much.